Home Books The Vital Question. Why is life the way it is? 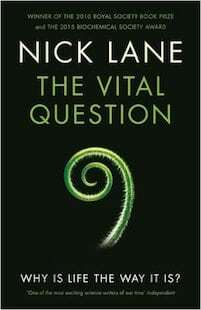 "A bold, eloquent, confident book… Nick Lane is not only a master storyteller, but this is his research… he’s that rare species, a scientist who can illuminate the bewildering complexities of biology with clear, luminous words"
Nick Lane presents an eloquent, compelling argument that draws on cutting edge research from biochemistry, cell biology and genetics, and approaches the question of the origin of life from a very different perspective: energy.